Aka (Hrusso) Elite Society (AES) has threatened to resort to agitation against NEEPCO as they have not fullfilled their various demands. 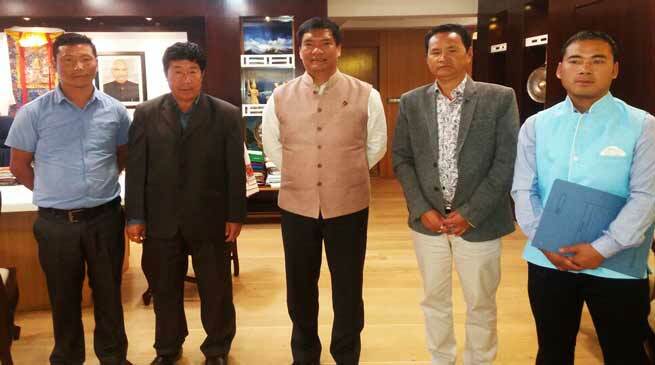 A team of AES led by it’s General Secretary Dibru Dususow, and All Aka (Hruso) Students Union (AARSU) President Atul Tasuso, General Secretary David Jabisow submitted a memorandum to Chief Minister Pema Khandu at his office on this issue. Through this memorandum they demanded ” regularisation of the local Work Charges (WC) of employees working in the NEEPCO 600 MW Kameng Hydro Electric Power Project in West Kameng district, creation of 300 more post as per the Draft of National Electricity Plan’2017 and absorb the deserving uneducated youths of the Project affected areas. They informed Chief Minister that it has been over seven months already since the last specific time frame of 31st May’2017 given to the NEEPCO, and after several meeting and submission of the memorandum to the NEEPCO authorities at various occasion , initiatives has not been taking place till now. They further informed that, now once again they have given a specific time frame of one month which will be end on January’2018 with a hope and expectation that the matter would be solved. Further they informed that the whole Hrusso community under the aegis of AES and AARSU would resort to democratic agitation against NEEPCO and the this memorandum have also sent to CMD, NEEPCO, Shillong through Head of Project, NEEPCO 600 MW Kimi recently. While talking to Arunachal24 AES General Secretary Dibru Dususow said that we would not accept or entertain any assurances, verbal or written and the democratic agitation would not be called off until the grievances are fully addressed and solved as we have on several occasion received such assurances in past. They said that the CM have patiently heard their grievances and assured to take up the matter with the NEEPCO authority so that a resolution comes at the earliest.